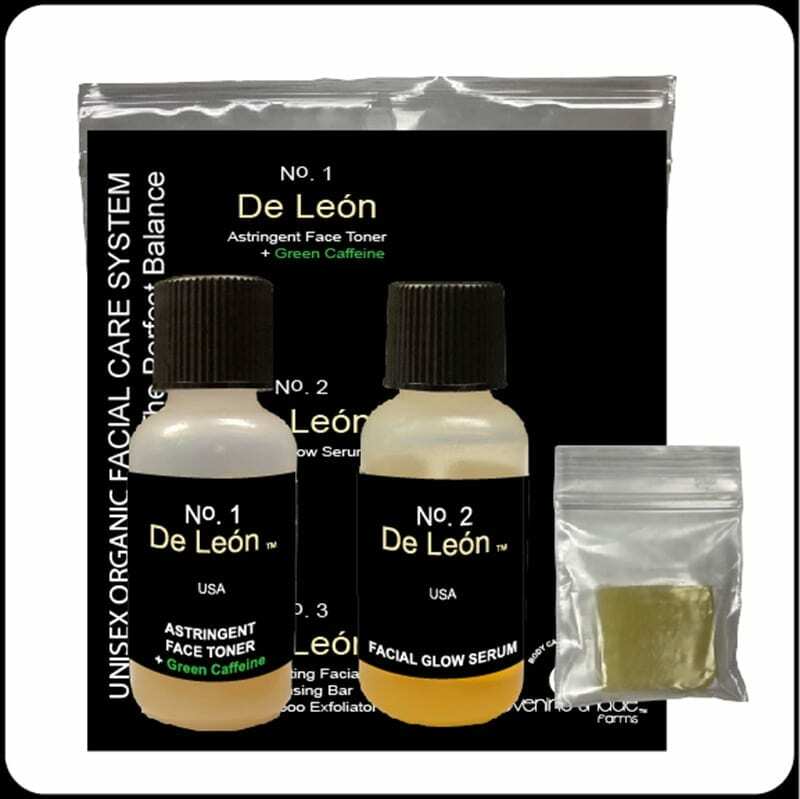 Lets you try our Unique and Proven Organic Facial Care System…which includes an amazing De León No. 3 Exfoliating Facial Cleansing Bar + Bamboo Exfoliator, De León No. 1 Astringent Face Toner + Green Caffeine and De León No. 2 Facial Glow Serum that you custom blend. With age and sometimes chemical abuse, skin fails to properly respond to Mother Nature. Evening Shade Farms, relying on The Wisdom of Elders proven Folk Medicine, and careful observation for over 30 years, has developed a skin care system that can assist in the youthful restoration of this remarkable organ. De León No. 1 Astringent Face Toner + Green Caffeine, will tighten, tone, and soothe skin inflammation. When blended with De León No. 2 Facial Glow Serum, you can expect to get Mother Nature’s attention…with the natural glow of your skin. Use De León No. 1 Astringent Face Toner + Green Caffeine alone or together with De León No. 2 Facial Glow Serum. Elizabeth, Jan 1, 2016, I recently made a purchase of wisdom of elder soap and ointment for my mom and you threw in a sample of De Leon 1,2 & 3 Sample pack. I have truly fallen in love with it and have only used it twice. I was thinking this morning after putting on my makeup, I can’t wait get home and clean my face. I will be making a purchase soon! After having such an amazing feeling I can’t wait to see if this helps my mom with her hand and foot syndrome (side effect from chemo). My fingers are crossed and look forward to more purchases. Thanks for sample. Lets you try our unique Facial Care System that YOU custom blend to restore and maintain your optimum skin balance. Cleansing with De León No. 3 Exfoliating Facial Cleansing Bar + Bamboo Exfoliator, Blending De León No. 1 Astringent Face Toner + Green Caffeine and De León No. 2 Facial Glow Serum, provides penetrating micro-nutrients that nourish and protect, leaving no oily residue. Follow with De León No. 1 Astringent Face Toner + Green Caffeine & De León No. 2 Facial Glow Serum. • Follow With Small Amount (size of pea) De León No.2 Facial Glow Serum Over Entire Face, Eyes, Neck & Decollete. For Oily or Acne prone skin, add more De León No. 1 Astringent Face Toner + Green Caffeine. I ordered my favorites De Leon #1 and #2 recently and was sent a lovely sample of #9 the body serum. I’m not sure how to use it, can you give me some ideas/advice? Thank you so much for your lovely comments. It’s so gratifying to know folks appreciate what we do for their skin. It’s our passion to provide the very best skin care on the planet! De Leon No. 9 Body Serum is a powerful body serum packed full of beneficial micro-nutirients, vitamins, enzymes and minerals specific for keeping your skin healthy, fit and protecting the skin from environmental insults. Think of this serum as if it were “organic food for the skin” It also offers anti-aging, anti-oxidant therapy that is provided by organic green caffeine. An added bonus the serum delivers from the green caffeine… it helps with contouring and eliminating orange peel appearance to thighs and buttocks. De Leon No. 9 Body Serum can be used in place of body lotion any time night or day and after the bath or shower! If you have any further questions please feel free to let us know.